If you’ve never heard of Turmeric Milk, you are certainly in for a treat. “Golden milk”, or Turmeric Milk is definitely one of my top night time drinks to enjoy on a cold winter’s evening. This drink is not only completely comforting, relaxing, and soothing, but extremely nutritious too. Turmeric contains loads of nutrients especially antioxidants and anti-inflammatory compounds, which make it an extraordinary spice that should be included in our daily diet. The warm, bold, and earthy flavour of turmeric milk coupled with a hint of natural sweetener makes this the perfect comforting drink to fight the cold. 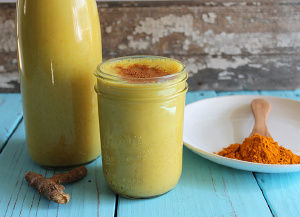 Traditionally Turmeric Milk comes from many Ayurvedic practices and medicine in Indian cultures. Turmeric is an age old healing elixir. Eastern cultures consider turmeric to be a “healing spice” that can be used to heal sore throats, colds, flus, inflammation, digestive problems, cancer, stomach aches, wounds, abrasions and skin issues due to its antibacterial and antimicrobial properties. Turmeric has even been shown to assist with cancer prevention and cure, particularly prostate cancer. You will always find turmeric in my pantry, and regularly incorporated into my meals and recipes. With the cold creeping up upon us, this healing elixir is a must try for sure! Turmeric milk is not only high in antioxidants, anti-inflammatory compounds and healthy fats, but also manganese and iron. In traditional recipes, this Golden Milk drink includes peppercorns, to enhance the absorption of curcumin (the main component found in turmeric) into our bodies. The ingredients in this recipe actually work in a synergistic fashion, which is fascinating! I love using turmeric in curry dishes, dressings, sauces, and a little sprinkle in smoothies for an extra health boost. My favourite way to unwind after a long busy day, is with a warm and cosy cup of this delicious Golden Milk, paired together with some relaxing music, fuzzy slippers, and a comfy blanket. There is just something so beautifully warm and calming about the gentle aroma this turmeric, peppercorn, cinnamon, ginger, and coconut milk infusion filtering through the house. Even if you’re on the go and want to enjoy this, you can still reap the benefits by just adding about 1/2 teaspoon ground turmeric, a dash of cinnamon, and sea salt into some coconut milk, shake it up and go! But I promise, the experience of making this over the stove and enjoying it warm is one to be experienced first.